I recently listened to Steve Pavlina’s podcast entitled, “Life, the Universe, and Everything”, and it got me contemplating our soul purpose and the worthiest pursuits in life. Throughout our evolution, humans have questioned why we’re here and (as explained in the Second Insight and again in the Twelfth Insight), we’re now at a point where we’re starting to understand our existence. We are finally able answer some of humanity’s most pressing questions. There is no doubt in my mind that we are here to develop consciousness. We’re here to fully experience ourselves, and to become aware to the fact that we actively create our reality. 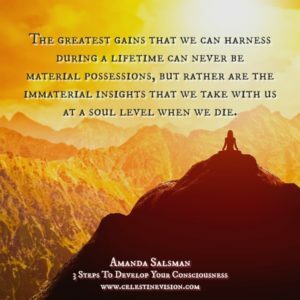 The greatest gains that we can harness during a lifetime can never be material possessions, like cars or houses, but rather are the immaterial insights that we take with us at a soul level when we die. Since we leave everything in our physical reality behind, it stands to reason that the gains we carry with us must consist of attributes such as honesty, courage, compassion, connection, discipline, enhanced intuition, centeredness, and balance: the very things that allow our consciousness to grow and evolve. However on the flip side, we may also accumulate more negative qualities such as irrational fears, limiting beliefs, bad karma, anger, and depression. What we choose to experience is up to us – as is the degree of alignment we enter into in order to develop our consciousness. As we set out on the journey to expand and strengthen our consciousness, we will learn and develop the tools to have mastery over our minds. We can usually tell how well we are living by analyzing any repetitive states we find ourselves in, how successfully we are achieving our desires, and the level of happiness we feel – although, gauging our progress can sometimes be confusing. The guiding principles of Truth, Love, and Power can provide a framework to help us. This is a simple method that allows us to determine where we’re succeeding and what we still need to work on to get into alignment. Most of us have spent years searching for the truth buried within ourselves and within our society. We read, we discuss, we study, and yet at the end of the day, we’re often left feeling unsatisfied. Perhaps, this is because as much as we say we want the truth, we don’t accept the truth of what “is”. Rather, we resist and reject what we have projected into our current reality. Once we drop this habit, we not only build our consciousness, but also come to understand our circumstances and make more accurate predictions for our future. Practicing mindfulness and objectivity helps us to tune into the real truth and allows us to fully accept the outcomes of what we experience. Am I accepting my body and appearance? Am I enjoying my job and succeeding in my goals? What kind of people am I attracting into my life? Am I having trouble making friends? Am I having financial issues or lacking stability in my life? Am I experiencing power struggles in my relationships? Am I reacting emotionally to the actions or words of others that really have nothing to do with me? Do I procrastinate on my responsibilities? Do I have time for myself? In considering our answers, we may notice that we feel incapable of genuine honesty, and have to dig deep to find out why. We may have to work hard to accept some feelings if we uncover parts of ourselves we don’t like. But by centering ourselves in love, we can work through even the most difficult of truths.